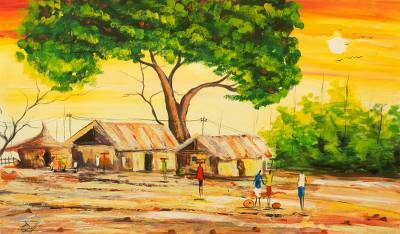 Acrylic Impressionist Painting of Village Tree from Ghana, "Northern Settlement"
A large tree protects village huts in this Ghanaian painting. Featuring a vibrant array of colors, the painting is presented by Francis Amoah, who works in the impressionist style. People can be seen working and playing games, part of a domestic scene that makes a calming addition to any home. "My compositions often put you in a silent and reflective mood. They create a sense of curiosity about the entire picture in the observer's mind." "I try to catch the movement and flow of life that is happening around me all the time. "My name is Francis Amoah and I was born in the early 1980s in Accra, where I received my basic education. After senior secondary school I went to Art College where I opted for painting and graphic design. "My styles vary because of my approach to a particular theme, but my areas of interest are basically centered on women, Ghanaian lifestyle, people and places, townscapes, market and boat and beach scenes, etc. "The image and composition of my work talks about the indigenous, traditional and contemporary Ghanaian way of life. My compositions often put you in a silent and reflective mood. They create a sense of curiosity about the entire picture in the observer's mind. "I realize that color is for me a strong emotional tool of expression. As such I love to use warm, bright and rich colors. I use them to portray life in its common aspects. Whatever I paint is a social commentary of the things that I see and experience in my day to day interactions with nature, local people and the sounds that I hear in both tranquil and hectic locations within my native country, Ghana, West Africa. "My paintings have found their way to private homes and business in Europe, America and Africa. There seems to be no limit to where my art can be enjoyed and displayed with satisfaction, pride and happiness. It is a good feeling for me, to know that I am bringing this level of warmth and good feeling throughout the world simply by using the talents and skills that God has given to me. "I believe that art has come a long way in Africa. And know that Art to me means creation. It is my life-blood and I display my thoughts and aspirations in this way. "I have held a number of group and solo exhibitions, in Ghana and Europe. In 2007 UNICEF selected some of my paintings to be part of their greeting cards collection. "I open my heart and mind to you, through my brush strokes and the use of color in the most vibrant form, with depth and with feeling." Francis Amoah's paintings are absolutely beautiful, representative of the the highest quality and are excellent investments . I recently purchased a piece by Francis Amoah's and quickly become captivated and mystified by his effective use of colors, superb use of impasto and the ability to draw the viewer into the scenery of his subject matter. Francis Amoah is truly a Master Artist! A great artist!I am glad to have 3 of his paintings!! Very fast service too! Thanks a lot!